This is my Sicilian family’s traditional meatball recipe using beef, pork, and veal. 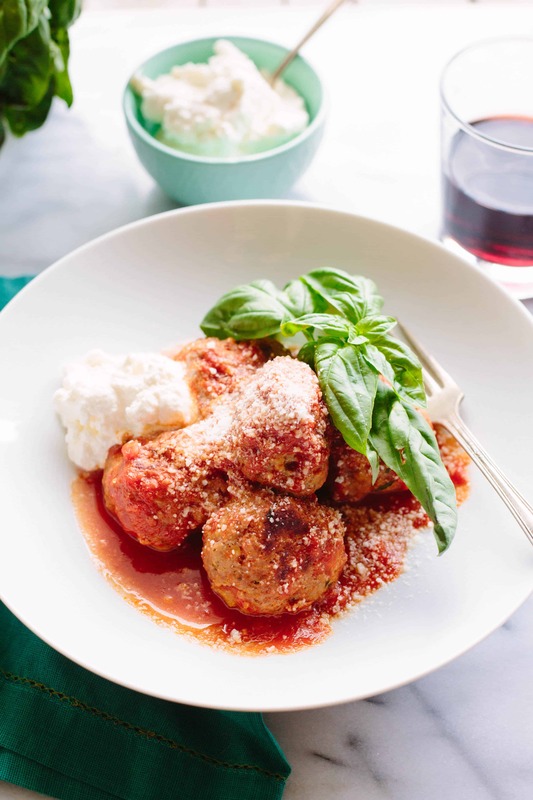 These are the best Italian meatballs you’ll ever taste! Hello and happy Saturday! I hope you’re enjoying a hot cup of coffee and some extra time off this weekend. I also hope you’re in the mood for meatballs because that’s what’s on the menu today. Meatballs are one of my most beloved comfort foods. They remind me of my family and always taste like home. 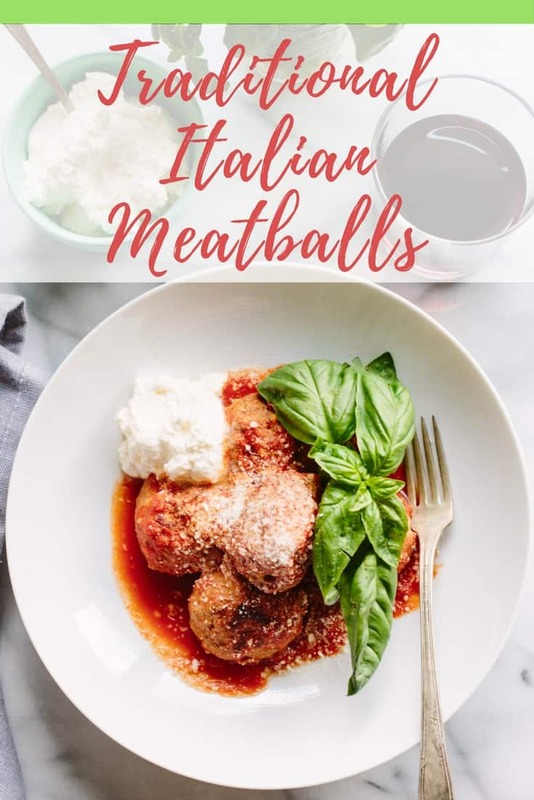 These meatballs are a combination of my Sicilian family’s traditional recipe along with a few tricks I picked up along the way. I know a lot of people say this, but these are the best meatballs ever. Don’t believe me? You’ll just have to make them for yourself. Before we get to the goods, lets address the elephant. As you may or may not have noticed, I’ve been on a hiatus these past few weeks. Thanks to a little smoothie shop called Soulberri, I’ve been a bit preoccupied and it’s forced me to step back from a few things in life, namely blogging (also: cooking, gardening, seeing my friends, and general r&r). I’ve missed it for sure, but it’s also given me a chance to look at things from a different perspective and reevaluate what I’ve been doing. Through this process I’ve begun to realize that the routine of creating recipes, photos, and videos has become lackluster and robotic. Two years ago, when I started blogging full time, I set a goal to post twice a week – once with a regular long-format blog, and once with a video – and gave myself strict deadlines. I stuck with it and managed to create a pretty fat catalog of content as a result. I’m super proud of that. But lately I’ve been struggling to find inspiration, and consequentially many of my posts have been feeling a bit… forced. I’ve found myself pressing the post button even when I’m not totally thrilled with the content; be it my writing, my photos, my videos, and sometimes, admittedly, even my recipes. That is all wrong and totally the opposite of why I started blogging in the first place. It has to stop, and starting today, it will. Moving forward, you can expect the unexpected. What I mean by that is you won’t find me posting every Tuesday and Friday like I used to. My posts will come only when I have the time, energy, and inspiration to create something I’m truly excited to share. I hope that happens more often than not, but the future is uncertain. One thing I can promise is that they won’t be forced. Ever. I also decided to change up my video format. Well, maybe. I’d like to see what you guys think before committing. This is the first of two videos I shot in a newer, longer format. Typically I try to keep my videos under two minutes because people have short attention spans and like to get information quickly. I’m no different. I get it! With that said, it’s nearly impossible to fit everything I want to say about a recipe into that short amount of time. I leave out stories, tips, and so much important information solely to keep the videos brief. Take my pie crust video for example. It’s so rushed that you can barely follow along, thus defeating the whole purpose. This self-imposed time constraint also forces me to deliver a pre-written and rehearsed set of words that can come off as contrived and inauthentic. I’m over that. So, I have two options (three if you count hiring someone to shoot and edit the videos for me but that’s not an actual option rn): Start making videos like the ones you see on Facebook that have no personality, just a set of hands creating a recipe set to music. Or, start making longer videos comprised of me standing in a kitchen and cooking in real time. I’m much too vain to go with the first option, so I’m testing out the latter and I’d love to get your opinion. As for the meatballs… you’ll just have to watch the video to see what they’re all about. If you can’t take the 15 minutes needed to watch all the way through, I understand. You can just skip to the recipe below. All I ask is that you leave me a little feedback… Please refrain from anything harsh and trolly (because I have fragile feelings and I already know I say um a lot and there are too many jump cuts). A few honest and kind words regarding the length, style, and overall content would be most helpful. After all, I’m not making these videos for me, so without your input I’m just shooting in the dark. Quality over quantity. This is something I’ve always felt strongly about and will be my motto moving forward. I value you as a reader and want to provide something you’ll always look forward to reading, watching, and of course, tasting. I’d love to hear from you. In the meantime, enjoy your meatballs. Get my homemade tomato sauce recipe here, and my homemade ricotta recipe here. Preheat the oven to 450 degrees and line a sheet pan with parchment paper. In a large bowl, combine the breadcrumbs and milk. Use a microplane grater to finely grate in the garlic and onion (you want about 1 1/2 – 2 teaspoons of onion pulp). Add the salt, egg, grated cheese, and parsley, then use your fingers to mix until everything is combined and smooth. If the breadcrumbs and milk have seized up and gotten hard, add a few splashes of milk until it loosens enough to easily mix. Add the meat and mix with your hands until the breadcrumbs are evenly distributed and the mixture is relatively homogeneous. Be careful not to overmix or it will cause the meatballs to become tough. Wet your hands and form the meat into whatever size balls you desire – I like them to be about 1/4 cup big. Space them out evenly on the parchment-lined baking sheet. Bake for about 7 minutes, then turn to the other side and bake for an additional 7 minutes. The meatballs should be nicely browned on two sides. While the meatballs are baking, prepare your sauce or have it heating up on the stove. Place the meatballs directly into the sauce after cooking. Simmer on the lowest heat setting possible for approximately 1 hour. If you need to keep them for longer, turn off the heat and just let them sit in the sauce until ready to serve, then gently bring them back up to temperature. 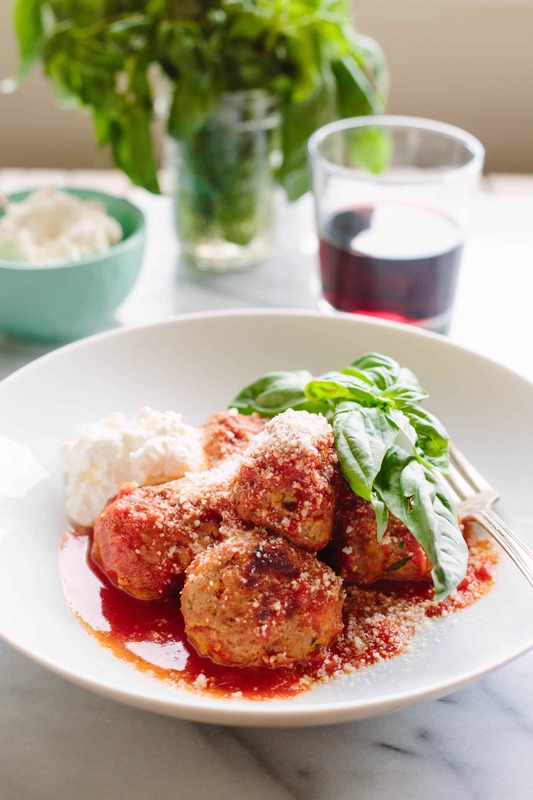 Serve meatballs with extra sauce, a sprinkle of cheese, a dollop of ricotta and a sprig of fresh basil. I like to serve them with a salad, but pasta is of course always an option. I like the new format if I am trying to cook along. Sometimes I just like to sit and watch some of your quick vids, but it is difficult to cook along with them. and hard to keep replaying when your hands have olive oil on them. what to do…..what to do….both! Coley – First things first: Loved the hair worn up. Seriously, look at pics of Gina Lollobrigida when she was in her 20s. I’ve seen you in person, watched most of your clips and seen you on TV and you looked bellissimo in this video and VERY Italian. Oh, and the kitchen looked terrific. Nice job by you and your husband. Clean lines, smooth textures, looks easy to maintain and clean and basically – modern without being garish. Now – I find the extended video version easier to follow than the shorter 2 ½ minute versions. I found that if I wanted to, I could follow along while prepping this dish and I enjoyed being able to understand more about the recipe and how you feel about it. What’s important to me is that these are mostly YOUR recipes so how you came to this particular version or iteration of it is important to serious home cooks. And yes, it is a bit jerky but a single fixed camera doesn’t give you a whole helluva lot of options. I could imagine how good this would have been with a professional editor, three cameras running and a budget like the one that Food TV has to work with. For a relatively new blogger, I thought it was funny, convivial, friendly but not goofy and instructive with instructive being the key issue. (The milk additions are a part of that point: cooking is not baking – there are rarely strict, unbending rules on ingredients, merely guidelines to achieve a certain flavor profile. Most of my recipes are moving targets – my wife asks ‘how did you prepare the chicken this time? It’s terrific this way!’ And I say – ‘got me…’ You’re a professional so you can’t get away with that but I’m retired – I can do what I want! Thanks so much, Bruno! I always love reading your comments and appreciate all the support you give me. I’m glad you’re diggin’ Soulberri’s look – we can’t wait to have you there for some grub! See you in May. I love the new video format. This is what I’d follow along with while actually cooking (or in my case TRYING to cook). It’s like hanging out in your kitchen, watching you create some masterpiece and learning something in the process. There are a lot of valuable tips and details here and I like how they just popped up naturally in the context of what you were saying. I thought the length was good. I think it should be as long as it needs to be to cover what you want to share, as opposed to any set length. This one seemed about right for meatballs. I could see others being longer. I really like the somewhat unplugged, unscripted nature because I think it allows more of “you” to come through. This longer format allows more time for those oh-so-relatable references to family/experiences, that signature Coley wit, and, yes, a couple flailing arms and a few “uhhs” thrown in here and there for good measure. Speaking of, I wouldn’t worry about that at all. Never forget, that “you” are who we follow. So, if that’s how you explain things, then that’s what we enjoy seeing/hearing. We want unabashed Nicole because that is what sets you apart from the others.. No one wants a generic Stepford chef with cookie-cutter dialog..we have the Cooking Channel for that. ???? I can imagine it can be hard to come up with new dishes so frequently. With such a substantial amount of recipes you’ve already shared here, there’s no reason you can’t create longer videos on something already in the portfolio. For example, I’d love to see a long version on your mom’s chowder or your grandpa’s linguine with the clams. And as lovely as your hands are, we don’t want to see them disembodied, working in a bowl. So forget that option, lol. As far as the old format, it might be good to still make those every once in a while too. They are some of the best produced and well executed clips out there. Pretty amazing you did those all on your own. I never saw them as how-to videos, so the newer longer videos don’t really replace them. The short ones are great for giving a general sense of the complexity of a recipe, and a preview of what one would be rewarded with by reading the blog. In that sense, they still serve a purpose. Besides, I think they are a great showcase of your on-camera, brand representation, and media production skills. Now where can one find fresh ground Parisian unicorn meat? Or do I have to ask Ina?!? I second everything Dan said. The out-takes of your old videos were always my favorite part, and this has them built right in! A couple weeks ago our cousin decided to bake some gluten-free carrot cake at my in-laws’ house. She brought her tablet in the kitchen and followed along as she watched this woman bake the recipe. That’s the first time I’ve ever seen a cook-along in action. Now I get it. It’s so much more than a recipe.